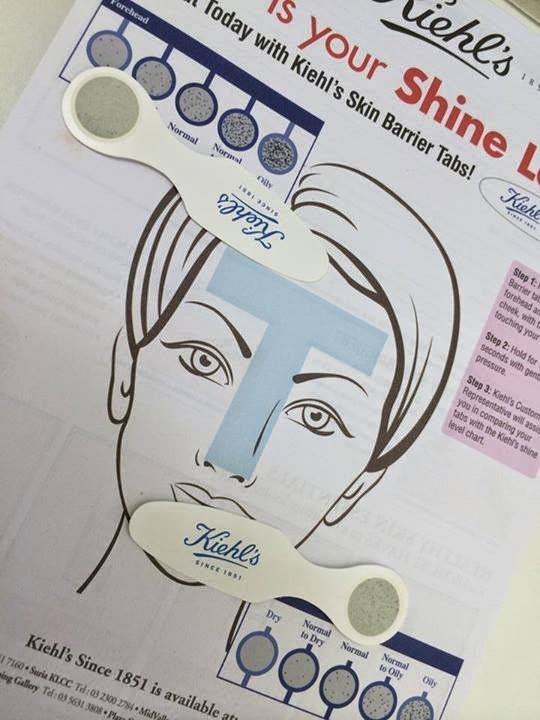 In one of my previous post I mentioned that I wanted to attend Kiehl's Fun In The Sun event because of the reasons mentioned in it.And on 8th of June,I managed to do so!The event was held at One Utama's Secret Garden..and I never knew it existed!Probably because whenever I go to One Utama it's at night to watch a movie and have dinner with the boyfriend. The garden was so beautiful and well maintaned.There were ponds,so many trees,shrubs,flowers..there was even lotus in the pond and I actually saw a real purple lotus!It was so pretty. The weather was super hot though and I'm glad that I dressed appropriately in a light chiffon top.But it didn't stop the sweat from pouring down.haha I did however wore my Steve Madden heels which I shouldn't have because my feet was throbbing after the event(the shoes were comfy but standing in it for a few hours is not!) that I changed into my Ipanema flip flops after it ended to walk around the mall with the girls. When I arrived at OU,the stores was still closed and there was no one around.That was actually pretty cool to me because the place is always packed with people.The lift to the Secret Garden only opens at 10am.I arrived earlier so I had to wait with another Butterfly blogger--Dr Zatil,for it to open.It was funny because we tried to find ways to go up since we couldn't press the lift button.We ended up meeting Tammy and Ayna from The Butterfly Project on the way up. Ayna and Tammy in their cool Kiehl's coat! 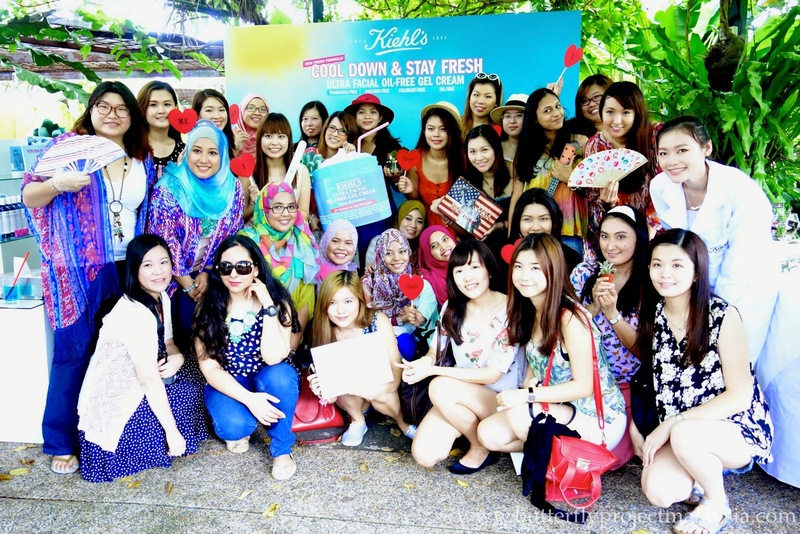 When we arrived,all the other Butterfly bloggers came too!We were greeted by the friendly Kiehl's team and we signed on Mr Bones..took lotsa pictures before we went to the area of the event which was situated at the end of the garden. 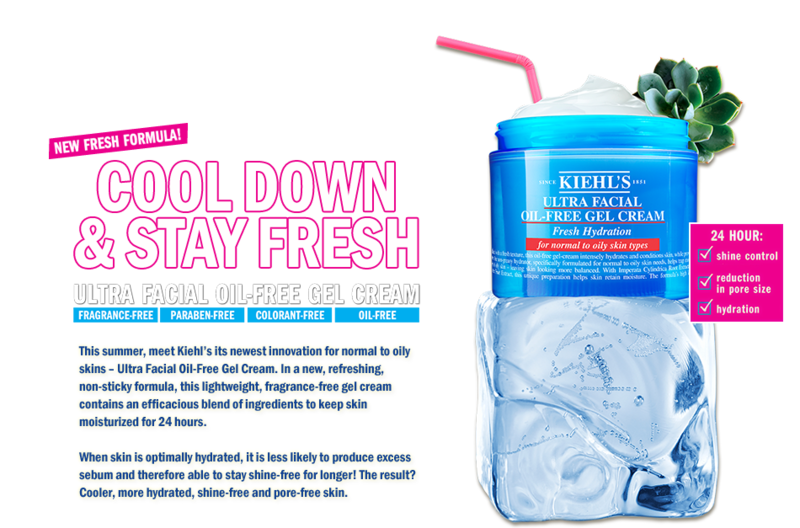 As we got there,we could see the pretty display of food,the hanging colorful lanterns and display of Kiehl's latest product-- their Ultra Facial Oil-Free skincare line. We were given a skin consultation to determine the shine level of our complexion.Surprisingly I got a normal complexion..but I think that was because it's still early in the morning. After the skin consultation,I learned how to make a terrarium with some of the Butterfly bloggers with Terrariums Malaysia.It was fun and an interesting thing to do!We got to take home the terrarium that we made!A terrarium basically consist of layers of dried moss,stones,dirt,topped with a cactus on top.They only need to be watered every 10 days.How low maintenance! Anfaal,Shasha,Shivani and I sat down to cool ourselves from the heat and admire our work.Afterwards we went to have a bite to eat and then took some more pictures with the other bloggers and organizers of the event.It was a simple and great event on a sunny Sunday morning. 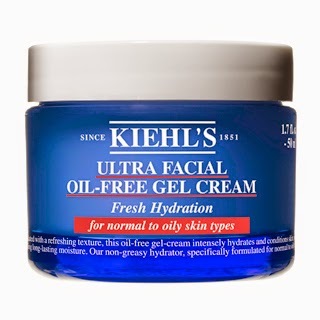 Each one of the 30 bloggers was given a goodie bag by Kiehl's which contained the whole range of their Ultra Facial Oil-Free skincare line.So far I've been using the product for a few days and I swear that the moisturizer is one of the BEST that I've used so far. It just feels really good on your skin.The texture is amazing and it absorbs really fast on your skin as well.Because you know..sometimes you have to wait for the moisturizer to sink in into your skin before you can put on your makeup..this one does the job fast!Plus it doesn't leave a sticky feeling on your skin and it doesn't sting or feels tight.It does a really good job.I can't wait to show you girls the difference that it has made on my skin in probably..3-4 weeks time? 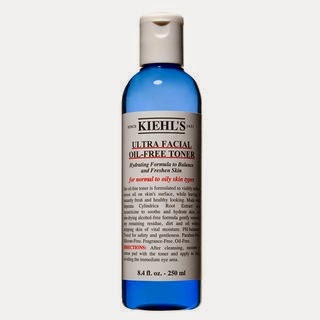 The main ingredient for Kiehl's Ultra Facial Oil-Free skincare is Imperata Cylindrica root.So I googled on what it is..basically it's a type of grass that grows in the desert. Hence why we had an activity to build a terrarium filled with a cactus because..how are you gonna decorate grass?They have the same resilient properties--cactus and grass,as both thrive in the desert. 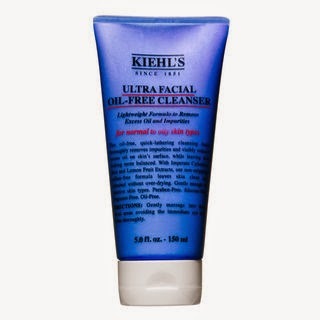 Here are the full line of products under the Ultra Facial Oil-Free range.You can click on the name of the products to know more about it on Kiehl's website.